Baby Boy is just starting to pull up on his feet and pretty soon he'll be walking! The Juppy Baby Walker is going to be great to use while he is on his way to learning to walk on his own. The Juppy Baby Walker is a solution to a previously recognized but unsolved challenge for parents of babies beginning to walk. Babies strong enough to begin walking but not strong enough to walk alone. The Juppy builds confidence in your baby and teaches balance while you maintain your natural posture, eliminating the grueling task of hunching over while teaching your baby to walk and, hopefully, eliminating the back pain that goes along with all that bending over. 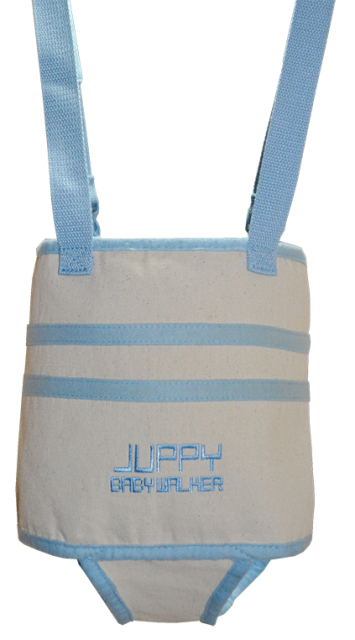 The Juppy has these great straps that are long enough so you don’t have to bend over to help your child walk. I think this is the best feature of the Juppy. You put your child in the harness and then you hold onto the straps to support your child. Juppy also has a zipper in the back, making it easy to put your child in and out of it. It even has 2 velcro straps in front of the zipper so that way you can adjust it to be the perfect fit for your baby. Baby Boy is 8 1/2 months old and when we tried out the Juppy he liked it, but he used it more as a jumpy toy than for walking. I think this will be more useful when he gets a little bit older and is starting to cruise around the furniture and more ready for independent walking. Follow & Connect: You can like Juppy Walker on Facebook and follow them on Twitter. Buy It: You can buy the Juppy Momentum Baby Walker on their website. Win It: One lucky person is going to win a Juppy Baby Walker of their own. Enter using the Rafflecopter below. Open to U.S. Ends 6/18 at 11:59 E.S.T. I need something new and exciting for my little guy, and this seems like the right product.i just know he would have a blast with this. i would love this for my little guy, he needs something new and exciting in his life and im sure he would have a blast. Looks like it would be fun for me as well.